The Missouri River is a major river of central North America. At over 2,540 miles, it is the longest river on the continent and is the second largest tributary of the Mississippi River. Its watershed drains nearly 530,000 square miles of the eastern Rocky Mountains and the Great Plains, spanning parts of ten U.S. states and two Canadian provinces. Approximately ten million people live in the drainage area, many concentrated in urban centers including St. Louis and Kansas City, Missouri, Omaha, Nebraska and Great Falls, Montana. 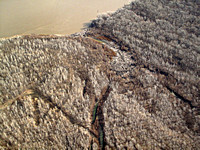 Throughout its history of industrialization and commerce, the Missouri has been severely polluted and degraded by human activities along its shores. Recognizing the need for engaged stewardship of the Missouri River, a grassroots organization, Missouri River Relief (MMR), has been dedicated to reconnecting people to the river through volunteer clean-ups and education events. Together with mapping dump sites and solid waste accumulations along the river, MMR has hosted 68 Missouri river clean-ups, bringing 14,208 volunteers to clean 592 tons of trash from 667 miles of the river. 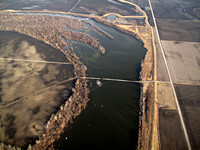 EcoFLight flew over sections of the Missouri River to identify clean-up sites which were be included in the "Big Muddy Clean Sweep", the flagship project of River Relief's 10th Anniversary celebration.